Discussion in 'General News' started by Ridemonkey.com, Jun 18, 2012. When we talk about long term reviews the term is usually limited to a season or two. The Thule T2, however, has stayed in Vernon's possession for over 7 seasons. As you can imagine, he's learned a thing or two about the rack. Have a read to see if it might be your next solution to the bike/car problem. First, a disclaimer: the rack you see here has &#8220;Sportworks&#8221; stickers plastered all over it&#8212;this is because that particular company created the T2 rack shortly before selling their consumer rack division to Thule. The T2, however, remained relatively unchanged for years, which is testimony to just how good the original recipe was. 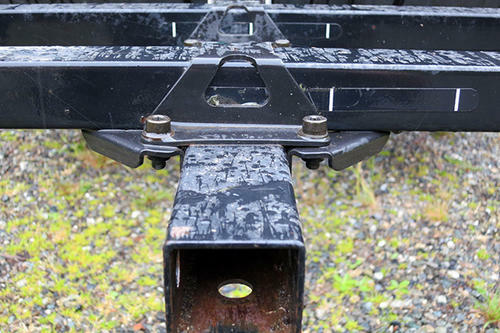 I picked up this hitch-mount rack the week it went on sale&#8211;this was back in 2005&#8212;and I&#8217;ve abused it daily ever since. Snow, rain, sleet, mud, drunken friends stumbling and falling onto the rack, legally-blind grandmothers driving their Buicks into it: the T2 has withstood it all and never once crapped the bed. All of the above continues to astound me because I&#8217;ve tested several other racks that, despite being brand spanking new, shake like they have Creutzfeldt-Jakob disease (that&#8217;d be &#8220;Mad Cow&#8221; for the less scientifically-inclined types out there), are an absolute bear to fold up, and simply don&#8217;t do the whole Carry-Bikes-Safely-from-Point A-to-Point B thing half as well at the Thule. In short, the T2 has aged miraculously well. Sure, mine&#8217;s a bit rusty and bent out of shape (that&#8217;d be the nearsighted octogenarian in the Buick), but I&#8217;ve never had to replace the wheel straps or the telescoping arms. I&#8217;ve never even snugged up a bolt, added a drop of grease or considered performing any action resembling maintenance to the T2. And let me just be clear on this point: this rack has spent every single day exposed to sun, wind and rain since I pulled it out of its box. No cozy garage time for this puppy. I am a cruel master. (2) Remove your muddy front wheel and toss it into the back of your car where it fouls your jersey, clothes and whatever else it was that you&#8217;d meant to keep clear of dirt and dog poop-encrusted tires. As if all that wasn&#8217;t impressive enough, you can also add a two-bike extension onto this rack. Four bikes on a single rack? Easy. I&#8217;ve hauled four bloated DH bikes on this thing and the T2 never wiggled, groaned or whimpered. Thule has made several changes (for the better) to the T2. In 2010, Thule tweaked the retention arm so that it clears 29er tires more easily (having said that, I can still get my first-generation arm over a Maxxis Ardent 29×2.4 tire, and that&#8217;s a beefy 29er tread). 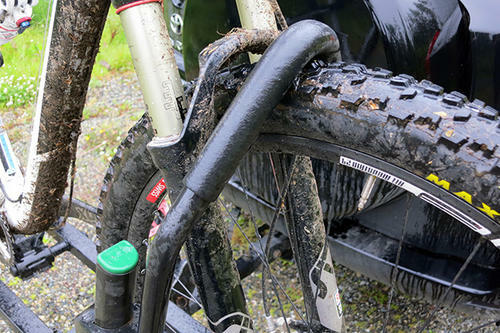 The new Thule arm is supposed to clear 29×3.0 tires. Likewise, Thule added a locking cable to the arm in 2011, which enables you to lock your frame to the rack. It&#8217;s not the kind of anti-theft device that guarantees peace of mind if you have to leave your bike sitting on the rack overnight in a really bad part of town, but it&#8217;ll fend off the average grab and dash. The entire rack, for that matter, also locks to your hitch mount now (another feature my pre-Thule model lacks). What&#8217;s not so groovy? Well, taking the rack on and off can be a bit of a pain because it&#8217;s one heavy mofo. Then again, that ridiculously stout frame is what enables you to haul four bikes around on an inch and quarter receiver. In short, I&#8217;ll vote for heavy and over-the-top sturdy every single time when I&#8217;ve got several thousand dollars worth of bikes riding on my rack. The price ($440 for the latest iteration, the Thule 917XTR T2) is also fairly steep, but this is definitely a case of getting what you paid for. I&#8217;ve never treated something so badly and had it work so well. I would have burned through several lesser racks by now and this thing just keeps on keeping on. In short, if you&#8217;re looking around for a bullet-proof bike rack and are wondering why you see so dang many battered Thule T2s at the trail head, well, there&#8217;s a good reason for that: this thing rocks. you can totally haul 4 bikes around on 1 1/4" receiver. Except that the 4 bike is limited to a 2" receiver due to the tongue weight. Was the 1.25 4 bike a one off for Vernon? "Can carry up to 4 bikes with the T2 plus a 918XTR 2 Bike Add-On&#8482; (sold separately, 2" receiver only)"
I'd like to add another downside. 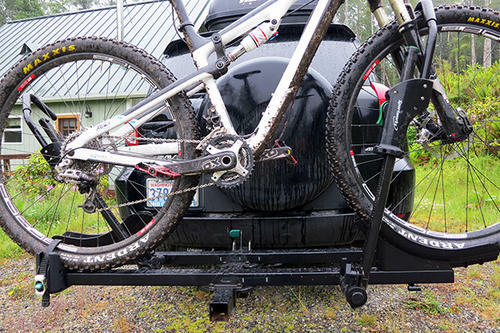 Hitch racks block access to the rear of your vehicle and are constantly in the way even without bikes on them. But overall I would give them a slight edge over roof racks because roof racks kill your gas mileage, creates clearence issues, and can be difficult to load. But personally, I think my spare tire mounted Thule "Spare Me" is better than both. I can strap two bikes to it (four bikes on a hitch stick out too far) and still open the rear door. The arms fold down when not in use and it weighs practically nothing. And, I just got a new one from EMS for $160!